FTP’s Hearts on Line, August 14 and 15, 2011. If you saw Hearts on Line last Sunday or Monday, you were face to face with characters pursuing relationships that began without face-to-face contact. I’ve been thinking about that since I saw Monday night’s performance, which I almost didn’t see. I was one of the last people ushered to the section of folding chairs set up for the overflow crowd. 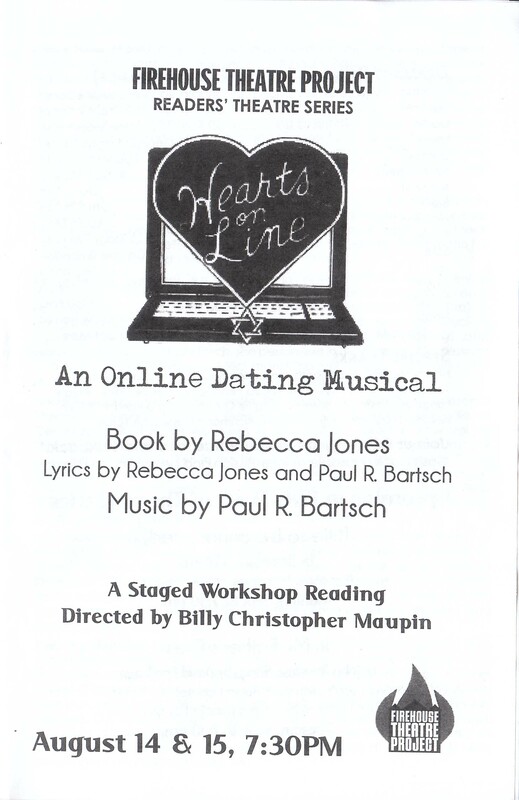 Live theater has far less cultural impact than the Internet now, yet the staged reading of Hearts on Line played to sold-out crowds on both nights of its run at the Firehouse, August 14-15. Playwright Rebecca Jones, Marketing Program Coordinator for VCU’s School of Business, depicts online dating with humor and insight, and the successful run of her show at the Firehouse attests to the value of black box theater as a venue for reflecting on our increasingly digital lives–if we’re willing to unplug for an evening.